I’d love to say that I came up with the idea for my recipe Scripture Bread with Selected Verses all on my own, but I didn’t! I loved this idea, but didn’t want to do a fruitcake. So I thought instead I would make up a platter of tasty treats that would complement each other and utilise the many foods mentioned in the bible. Not knowing the bible that well, I found an online King James bible and started searching for ingredients. I knew I wanted to make a flatbread, so I typed in “flour” and chose the best verse. I soon discovered that some verses mentioned a few foods in the one verse. Being slightly obsessive, I didn’t want to use those verses, so I had to find an entertaining verse that mentioned only the ingredient I wanted. This limited my choice, but I loved the challenge. I spent quite a few fun hours crafting recipes and searching the bible. 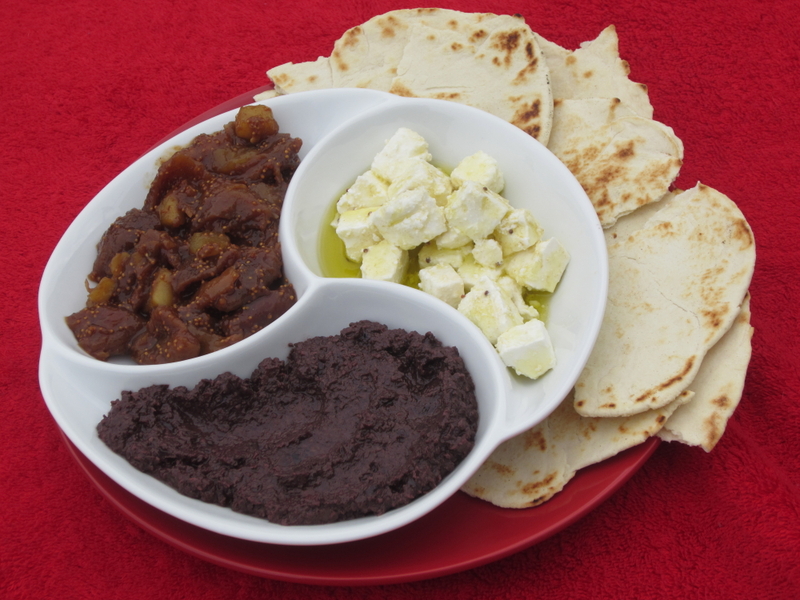 Biblical flatbreads served with marinated feta, olive tapenade and fig compote. You’ll need a King James version of the Bible to work out the ingredients – or you can just go to the list of ingredients at the end! Place all the ingredients in a glass jar, making sure everything is completely covered in liquid. Secure the lid tightly and refrigerate for 2 days, occasionally giving the jar a good shake. Process or blend the tapenade ingredients together until smooth. Cover and refrigerate until needed. Bring all the ingredients to a simmer in a medium-sized saucepan over medium heat. Cook for 30 – 35 minutes, stirring occasionally. Allow to cool before refrigerating until needed. Combine all the ingredients in a medium-sized bowl. The dough should be slightly sticky. Turn dough onto a lightly floured work surface and knead for 5 – 10 minutes or until smooth and elastic. Divide dough into 4 balls. Roll each ball into the flattest circle you can. Heat an ungreased frying pan or griddle over medium heat. Fry each circle for 1 minute each side or until light brown. If the oil in the marinated feta solidifies, remove from the refrigerator at least 1/2 an hour before serving to allow the oil to return to a liquid state. When making the dough for the flatbreads, you may need to add more water or more flour to form a slightly sticky dough. You are killing me. This is exactly the sort of thing I would love to eat. A perfect feast for two on Christmas Day. How will I stick to my diet until January first. Will it go well with a Vodka Martini dirty? I can only hope everyone diets come January 2015. I am losing willpower and this is most delicious looking. It does look delicious – and tastes it too. It would go really well with a dirty martini. I had mine with cucumber gin. The scripture cake looks very very yummy and the idea of playing a game to guess the ingredients sounds fabulous. Another great piece of information you have shared look forward to more of you wonderful writing.